Participation is limited to 50 participants. Based on already expressed interest, we expect to receive more applications than there are places available. We ask potential participants to send their expression of interest together with curriculum vitae in pdf format no later than September 14th, 2010 to spela.sitar@ijs.si. 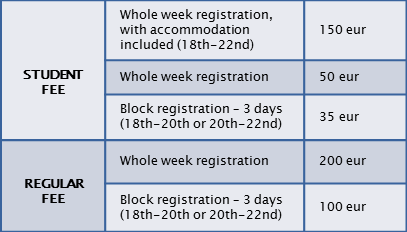 You can register to attend the whole week or only 3 days. We also added a Special student fee, which includes the accommodation in a double room from October 17th-22nd (5 nights) at the All Seasonss Aachen Hotel. All fees cover teaching materials, coffee breaks, lunches and dinner.